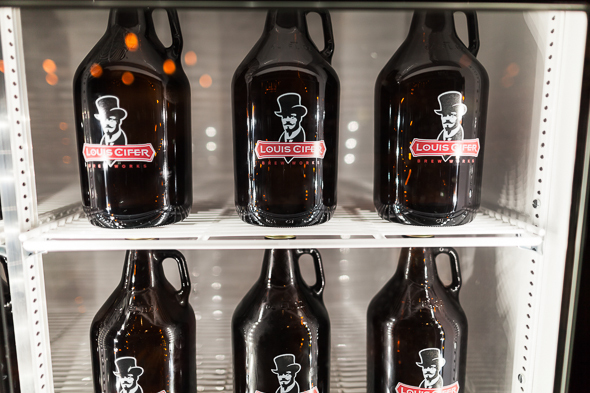 Louis Cifer Brew Works is a new bar from the owners of Stout Irish Pub , a successful craft-beer-focused spot in Cabbagetown. I visited the location prior to its opening for a friends and family preview to see if the new owners might be able to to make good with a brew pub where Davos, Legion, and 417 couldn't stick it out and end the losing streak that has previously befallen 417 Danforth Avenue. Punnily named with a nod to the devil (Lou Cifer, get it? ), the location itself is mercifully short on hell-themed decor and is instead, rather tastefully decked out in the sort of plush furniture and dark wood finishings you might expect from a decent franchise restaurant. Yes, a stylized, top-hat wearing Satan stand-in adorns the glassware and coasters, but instead of going heavy on the underworld theme, caged lightbulbs accent punched-tin ceilings and worn hardwood floors. 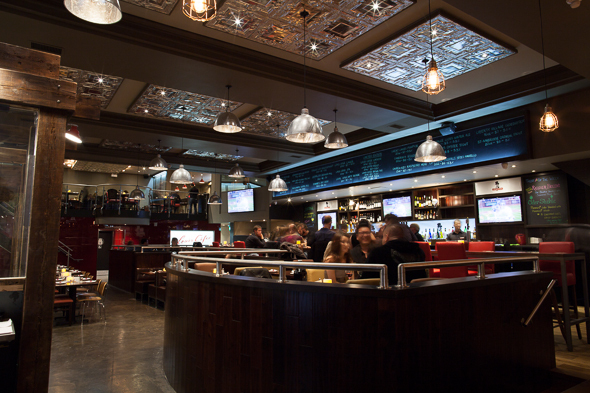 The well-lit, elevated bar area features three big-screen TVs and patrons saddle up in red-leather backed stools. 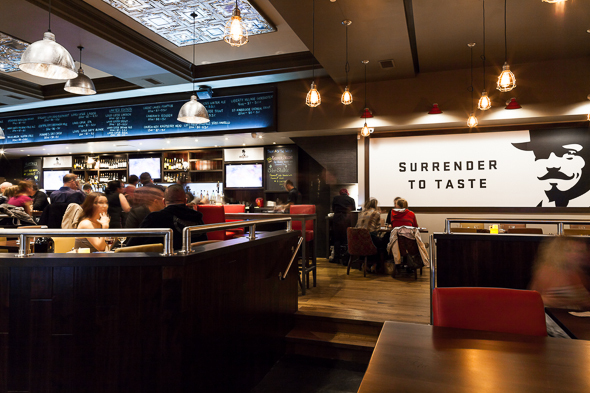 Overhead, chalk board signs advertise the draught lineup and there is a host of banquette seating, a few booths, and rows of tables along the glass wall of the not-yet-functional brewery. A carpeted upstairs mezzanine features its own bar and a projection screen that was playing playoff baseball on the night I visited. The menu features mostly bar standards like appetizers that include sweet potato fries ($7), PEI mussels made with bacon, fennel, onions, and arugula ($13), as well as wings ($14/pound), nachos ($14) and a cheddar and ale fondue ($12). 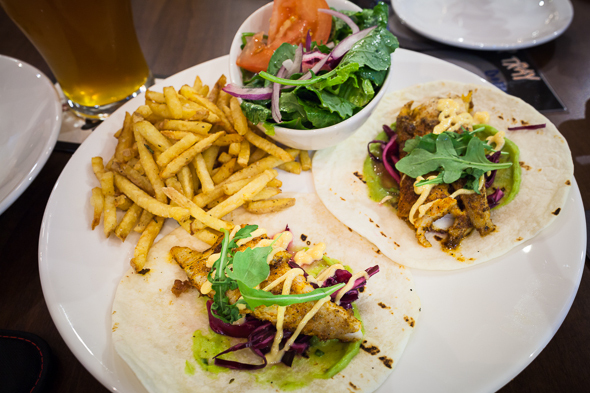 With main courses that run the gamut from safe (the burger, $14, is just what you'd want and expect) to predictable (the now-obligatory fish tacos served here as blackened-sole in a flour tortilla with avocado puree, red cabbage slaw, and spicy mayo, $14), the food will likely prove a draw here. Even the vaguely baffling cornish game hen, $25, which comes de-boned and thus not entirely pretty-looking (see below), is succulent and delicious. On the high end, a $28 rack of lamb feels a bit out of place among menu items that mostly come in under $20. 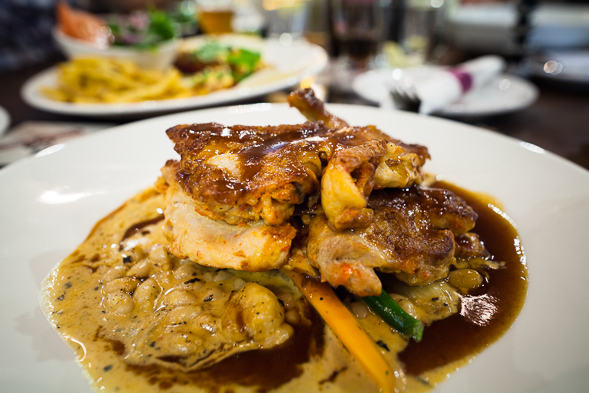 That said, the place advertises itself as a brew pub and those expecting stick-to-your ribs pub food will find just that and likely come away satisfied by a menu that features a handful of items actually cooked with beer. 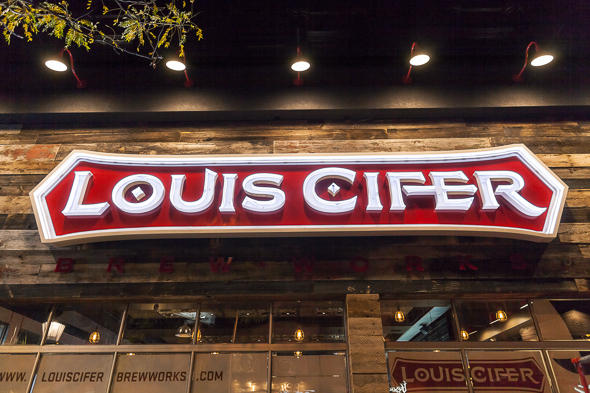 Unfortunately, the "brew works" part of Louis Cifer is where the concept tends to come off the rails a bit. 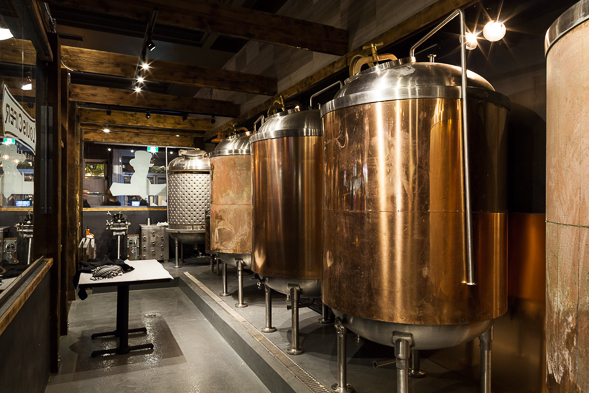 Firstly, there is not yet any brewing occurring at this brew pub. An onsite brewery is indeed in the works and will be housed in a glassed-in area in the dining room, but the brewery clearly isn't finished yet and doesn't look like it will be for some time. Until then, I'm told actual brewing is occurring at Railway City Brewery in St. Thomas, Ontario. Second, opening a restaurant that makes and serves its own beer is no easy task and, generally, when you hear that someone is attempting such a thing, you'd expect to hear that the brewing duty will be undertaken by someone with at least a few years of practical brewing experience from a large brewery like Mill Street. At Louis Cifer the offsite brewing is being headed up by recent Niagara College brewing program graduate Christine Nagy, and sampling a flight of Louis Cifer's house beers makes plain that she's not quite up to the task just yet. Louis Cifer IPA, the first beer I sampled, was both watery and overly bitter. None of the nuance of flavour you'd hope for and none of the aromatic citrus and pine you'd expect were present. 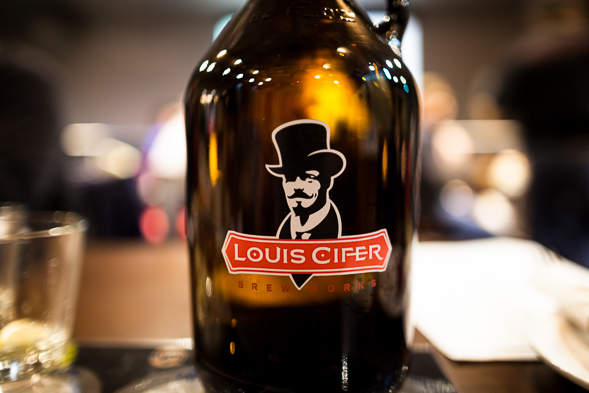 The Louis Cifer Dirty Blonde, a brown ale-blonde hybrid seemed an interesting idea and while it had its merits as an exercise in pairing the malty, nuttiness of a brown ale with a refreshing blonde, it was lacking somewhat in execution. Their brown ale, which showed some promise in its hazelnut, malty flavour, also lacked depth and was ultimately also watery. 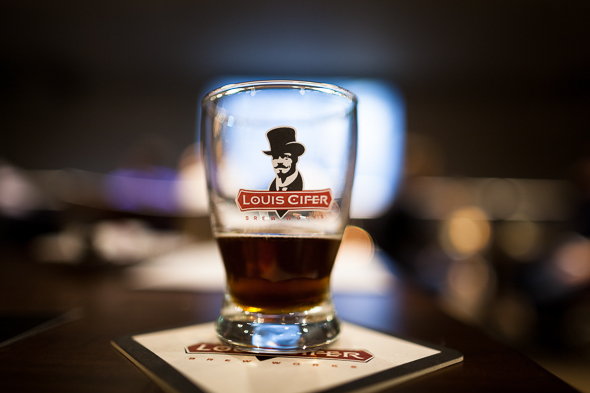 Indeed, the one beer I sampled that I might say was a hit was Louis Cifer's Lager--a perfectly respectable lager that wasn't overly sweet, had an excellent mouthfeel, and a great finish. That said, even though I don't want to be overly harsh to brewmaster Nagy given that she obviously hasn't had a ton of time to develop her recipes and still hasn't even brewed on what will be her "home" system, if you're looking to launch a brew pub on the merits of your lager, you might be headed for trouble. Although frankly, I'm not too sure that is the idea, and I'm not too sure the house beer will matter all that much. The venue has all the trappings of a welcoming local and one is hard-pressed to think of anything precisely comparable in the immediate area. 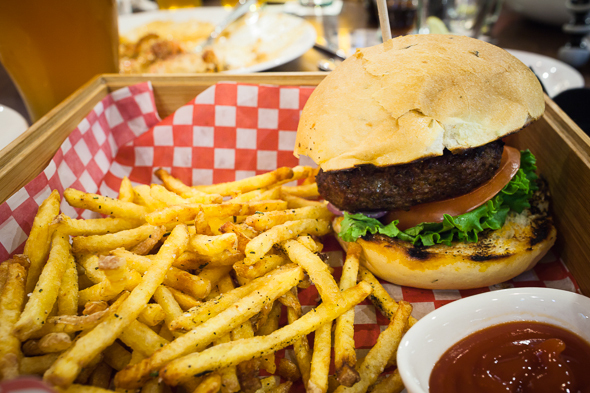 There's big screens, sports on, respectable pub food served in upscale, modernish stylings and, importantly, their house beer isn't the only stuff on tap. On the night I visited they were pouring Side Launch Wheat, Cameron's Cream Ale, Great Lakes 666 Devil's Pale Ale, Liberty Village Gosebuster and, the beer my entire table switched to after failing to find something impressive among our flight of house beers, Left Field Brewery's Prospect Amarillo. Ultimately, it's a good spot and, with a familiar menu and a welcoming atmosphere, it seems poised to do well with revelry-seeking east siders. But the house-made beer the owners are hoping to one day sell onsite and even in the LCBO simply isn't up to snuff. I'm optimistic the new brewmaster can find her stride once her actual brewery is up and running, but it's vaguely disappointing when a brew pub can't initially deliver on the "brew" part. After all, the devil's in the details. Ben Johnson also writes about beer over on Ben's Beer Blog . Follow him on twitter @Ben_T_Johnson . Photographs by Traven Benner .